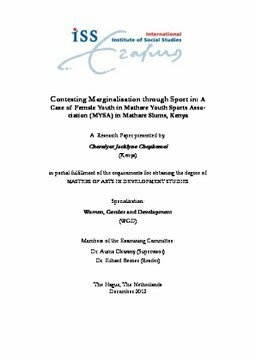 The study is an attempt to make visible the experiences of female youth from Mathare slums and how they are contesting their marginalisation by getting involved in Mathare Sports Association (MYSA) that uses soccer as an entry point to development through its various programs and activities. The findings reveal the difficulties faced by the female youth in slums which cannot be underplayed despite their attempts in the female youth exercising their agency. The research also highlights that the factors explaining their situation is attributed to the interplay of individual biographies with structural forces that need to be addressed. Thus, for female youth empowerment in these locales to be realised, such interlocking factors have to be put into consideration.